The Dodo’s are duo Meric Long and Logan Kroeber (often accompanied by an ever-changing cast of supporting musicians) and they hail from San Francisco. Long time stalwarts of the US ‘college scene’ their breakthrough album ‘Visiter’ was released in 2008, and they’ve gained a huge following since that time. The Dodo’s are famed for their live shows, and imaginative use of instruments (tambourine shoes, no really), and also for their vocals and very technical guitar structures. Labelled as ‘indie/folk’ some time ago, this feels like a label they have both outgrown and redefined. There is no doubt they have some roots in folks, but their ability to shapeshift throughout any of their tracks makes this feel like a catagorisation too far. Now on their fifth album, The Dodos have remained largely under the radar in the UK. Their peers could be listed as bands like The Shins, Grizzly Bear, to name a couple, but sadly they’ve never gained the same success over here. The Dodo’s play some of the cleanest guitar around today, and their production is always top notch. 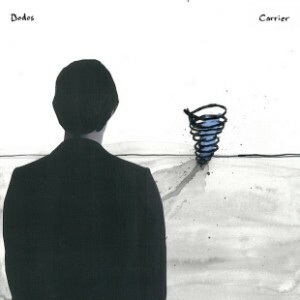 ‘Carrier’ is probably a little more low-key than their previous outings, it’s a relatively quiet album and a lot of the tracks could have easily worked acoustically. It is multi-layered and, in parts, very complex. First up is ‘Transformer’ which noodles in with a whisper, before building into the main melody. It’s reminiscent of (as previously mentioned) Grizzly Bear or Fleet Foxes. It has a very stop-start quality to the music, despite the continuous lush harmonies throughout. This track immediately sounds more ‘folk’ than The Dodo’s have previously sounded. Lots of work has obviously gone into developing their melodies. ‘Substance’ is louder and more anthemic. Kroeber’s drumming here are a little wonky, which adds a nice hook to the quieter parts of the track. The verse is littered with gorgeous chord changes. The slightly uneasy drumming rhythm continues throughout the album adding further depth to each of the tracks. The single ‘Confidence’ is a slow build. The vocals on this record are immaculate, and the production compliments them perfectly. Despite the very technical guitar parts, it never feels as if one is overshadowing the other. This track easily could work as just the vocal or guitar part. Building to crescendo, this is the first sign of an electric guitar being used in anger, and it demonstrates how agile The Dodos can be. They are very capable players. More harmonies bring the track to a close. It’s simple, but effective. I imagine this one would be amazing when played live. ‘Stranger’ takes things up a notch in terms of tempo. This is definitely a contender for the next single release. Vocal harmonies are amazing on this track, and the low chime of guitar on the verse is delicious, disarming and unexpected. It’s the details within these tracks that really bring this record to life. Mid-album ‘Relief’ begins with plucking guitar and you can hear every note. You will probably want to upgrade your headphones after hearing it. The Dodos are one of the most technical guitar bands around today, and they really know how to produce their sound. The lyrics sound almost hymn-like. It’s soothing and beautiful. The melody washes over the listener like a warm breeze on a sunny day. It really is that good. Part way though things get louder and guitars crash in with an anthemic build, before finishing as it begun. It’s immaculately played. ‘Holidays’ and ‘Family’ are strumming, breezing affairs. Light build-up with more of their textbook harmonies. This is the kind of record you could play all day, and at any volume. ‘Destoyer’ initially reeks of Animal Collective-esque vocal reverb, and the drumming is really left to run riot. It’s probably as close to math rock The Dodo’s are every likely to get, and it almost feels like they might trip over their own ideas. It’s great to hear them taking risks like this. It’s a very worthy component of the album, and possibly a sign of things to come. Later in the album, ‘The Current’ is really the showpiece of the record. With similar slow build to previous tracks, and Kroeber’s familiar stop-start drum signature, this is a track that features just about everything from what we’ve heard so far in a single track. There is nothing new here, but hearing it all together takes things to the next level. Penultimate ‘Death’ is an amazing ballad with a very choral feel to the vocal. A lot of this album would be suited to hearing in a venue like Union Chapel in London. It has so much depth and clarity. The album concludes with downbeat ‘The Ocean’. Rumbling in, sounding almost gothic, it’s haunting stuff indeed. Violins add to the drama and the sparse drumming compliment perfectly it’s slightly off-kilter execution. The Dodo’s have created a record of amazing depth and clarity, and also managed to combine their textbook harmonies and incredible vocals talents with some of the most technical guitar work I’ve heard all year. All of this is topped with some very interesting song structures. There are a lot of ideas at work here, and for a lot of the record it can be difficult to stop trying to analyse ‘what they’re doing’ and just enjoy the album. I’ve had the whole record in heavy rotation since it arrived, and whether it accompanies me on a journey to work, or is played in my living room at full volume (sorry neighbours) it takes on a new feel and meaning. This is not a record that will hit everyone on the same level. It’s subtle, and its detail is not always obvious, and it does take a few listens to uncover the gems on offer. This is not only a great album, The Dodos have raised the bar for guitar bands. This entry was posted in The Dodos and tagged Carrier, Polyvinyl Records, The Dodo's by admin. Bookmark the permalink.